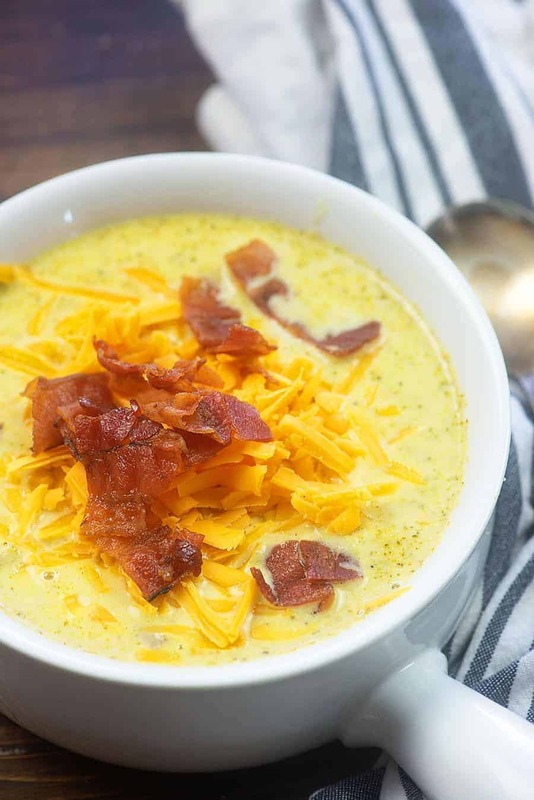 Crockpot broccoli cheese soup is quick to throw together and makes 12 cups of soup – plenty enough to serve your family dinner and still have leftovers for lunch. Just 4 net carbs per bowl! This soup is perfect for chilly nights. Broccoli is officially my favorite vegetable, which is weird because I feel like broccoli really gets a bad rap. I mean, it’s so green and funky looking. Kids love to hate it. It kinda stinks when you steam it. But, y’all, it’s just so GOOD and so easy to doctor up! I can do a million things with broccoli. I kind of wonder if the broccoli haters out there are mostly only hating it because they are starting with frozen broccoli rather than fresh. When I finally discovered my love of broccoli, I quickly grew tired of chopping up heads of broccoli every other day, and I ran to Costco and bought a jumbo sized bag of frozen broccoli florets. I thought I was soooo smart. Then I steamed that frozen broccoli and served it to my family and basically no one ever spoke to me again. They still hold a grudge. Moral of the story: if you think you don’t like broccoli, be sure to try fresh broccoli instead of frozen. They’re different. ? Anyway, let’s talk about this crockpot broccoli cheddar soup! It’s basically comfort food in a bowl, but it’s also healthy (hello, vegetables), low carb, and will feed a crowd. Love this recipe!! Slow cooker broccoli cheese soup starts with a whole lotta broccoli. I use fresh, as mentioned above. I generally just buy the bags of already chopped broccoli florets because I’m lazy, but you can definitely start with a couple heads of broccoli and chop it up yourself. 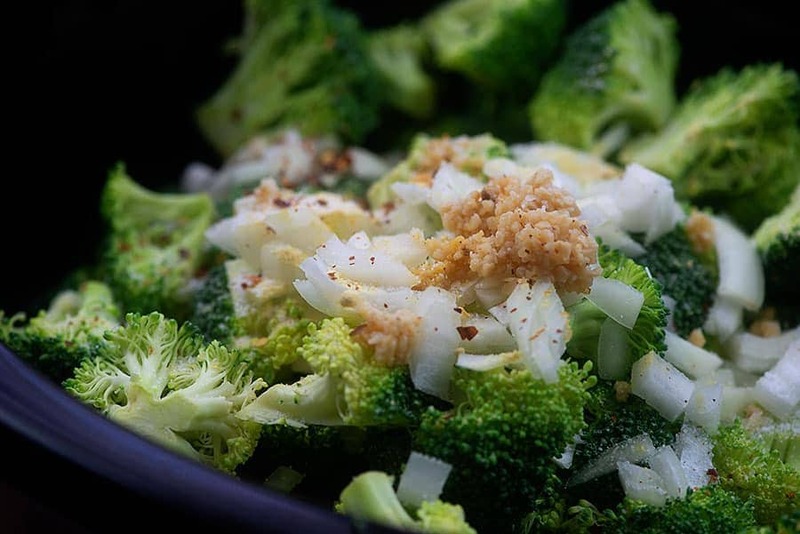 To your broccoli, add in some onion, garlic, chicken broth, cream, mustard powder, salt, pepper, and red pepper flakes. We want flavor in this soup and we’re going to get it! ? Cover and cook on low for about 4 hours or until your broccoli is very tender. The color gets a little funky after all that cooking, but just trust me. Things are going to get prettier and super delicious in a minute. Here comes the fun part: blending it up. I use an immersion blender and just pop it right in the slow cooker to do it’s thing. Here’s the one I have and love. (affiliate link) I think it’s a worthwhile investment – it’s fairly cheap and, while I don’t use it every day (or even every week), it’s super handy to have when you need it and doesn’t take up much space. If you don’t have an immersion blender, you can carefully transfer the hot soup to a traditional blender and blend it in batches. Be sure to vent the steam as you blend and just be careful not to burn yourself. Cheese! Lots of cheese! You can’t make broccoli cheddar soup without cheddar, but I also add in Monterrey jack for extra creamy goodness. Stir that around until the cheese is melted and you’re done! 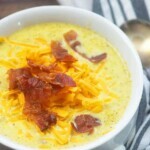 Creamy broccoli cheddar soup! Top it off with extra cheese and some crispy bacon, if you like. Healthy Green Bean Casserole: This is traditionally served on Thanksgiving, but it’s good any night of the week since my version is easy!! Roasted Cauliflower Soup: Roasting the cauliflower gives this soup extra flavor! Spinach Stuffed Chicken: The most popular recipe on this blog! Million Dollar Spaghetti: We’re using spaghetti squash to cut the carbs here. So good! 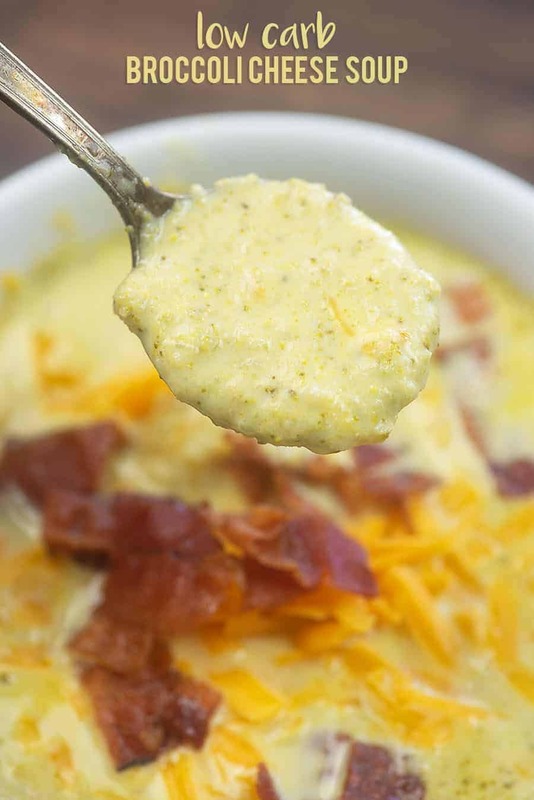 This broccoli cheddar soup is so simple to toss in your crockpot! 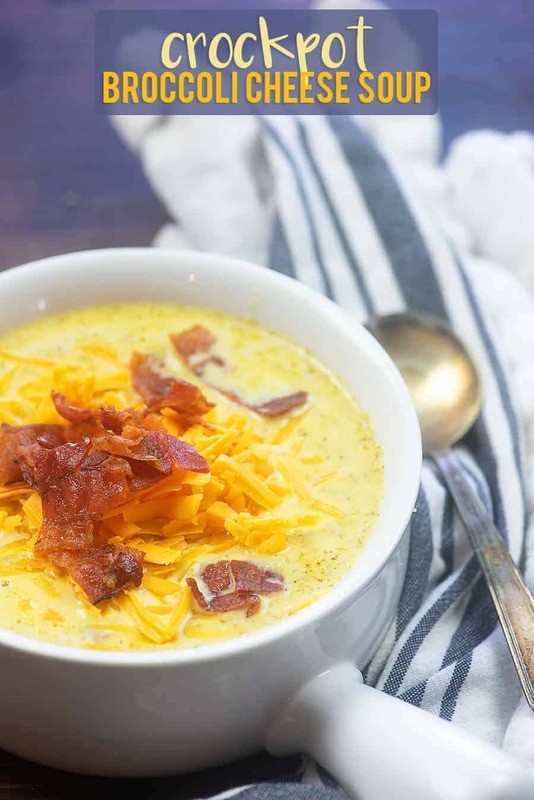 Blend it up for a thick, creamy soup that's perfect for chilly nights. 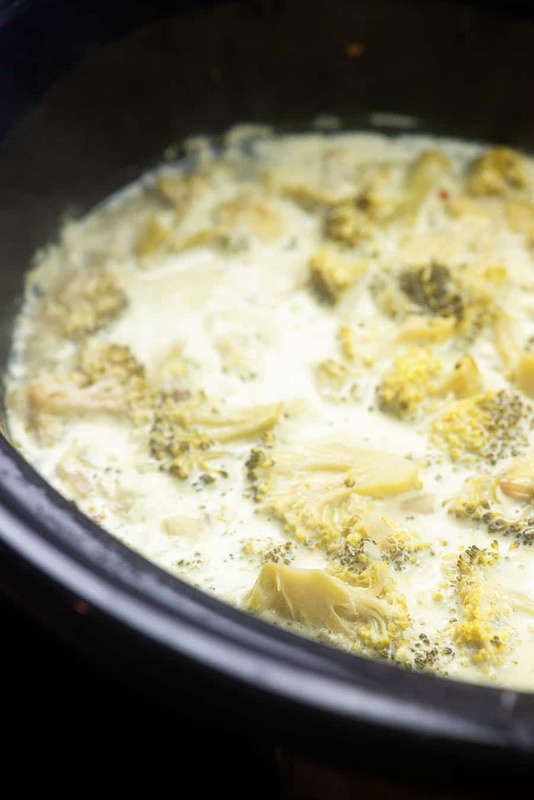 Add the broccoli, onion, garlic, chicken, broth, cream, ground mustard, salt, pepper, and red pepper flakes to a 6 quart slow cooker. Cover and cook on low for 4 hours or until the broccoli is very tender. 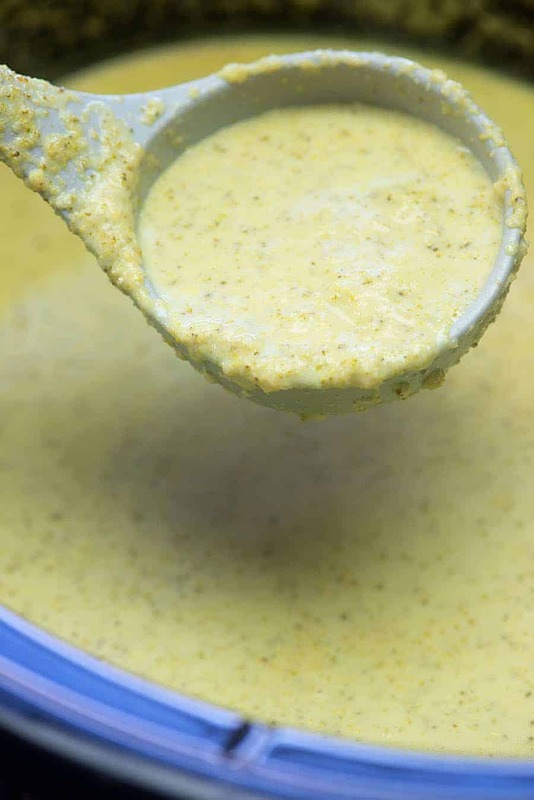 Use an immersion blender to blend the soup to a smooth consistency. Alternately, carefully transfer the soup to your blender in batches and blend. Be careful while blending hot soup and be sure to vent the steam when blending hot soup. 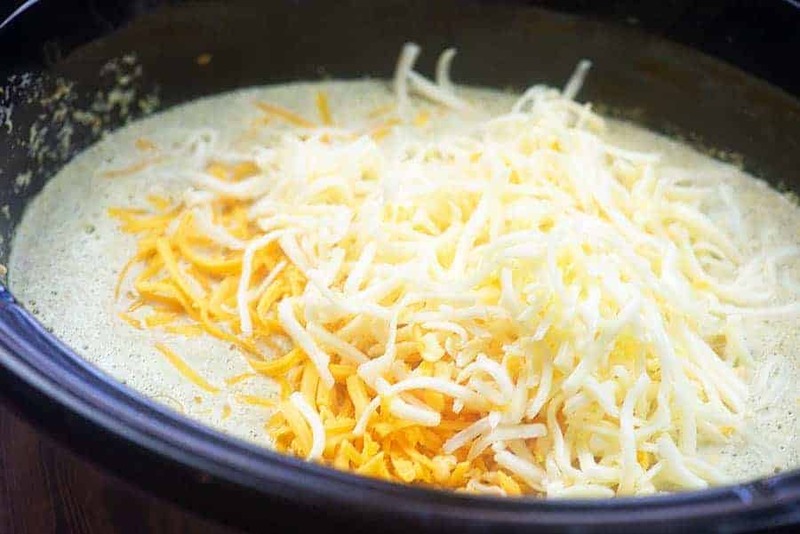 Add the cheese to the hot soup and stir well until melted and creamy. Serve immediately with additional grated cheese and crumbled bacon, if desired. 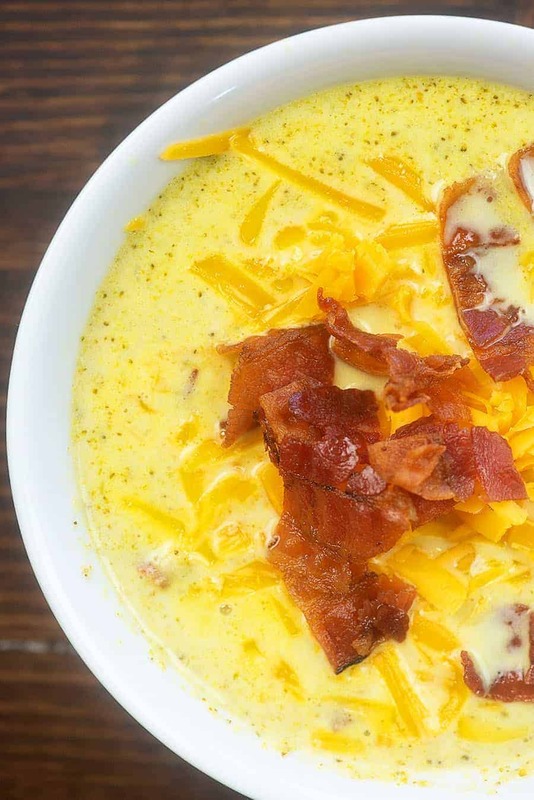 Top your bowl of soup with grated cheddar and crumbled bacon for extra flavor!